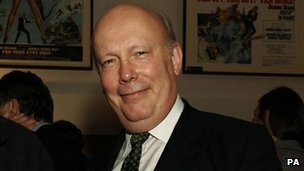 Shakespeare's Globe Theatre has called Julian Fellowes' comments about needing a "Shakespearian scholarship" to understand the Bard's work "misguided". The Downton Abbey creator said he adapted the language in his version of Romeo and Juliet to make it accessible. But Fiona Banks from Globe Education said no one should feel excluded from Shakespeare's original writing because of their level of education. "Shakespeare's for everybody. We can all understand him," she said. Fellowes, who won a best screenplay Oscar in 2002 for Gosford Park, had been criticised by Shakespeare experts for rewriting certain passages and altering the language used in the Bard's work for his film. However he told the BBC earlier this week the film was never intended to be a straight adaptation of Shakespeare's original play. "When people say we should have filmed the original, I don't attack them for that point of view, but to see the original in its absolutely unchanged form, you require a kind of Shakespearian scholarship and you need to understand the language and analyse it and so on," he said. "I can do that because I had a very expensive education, I went to Cambridge. Not everyone did that and there are plenty of perfectly intelligent people out there who have not been trained in Shakespeare's language choices." Ms Banks, who is a senior education advisor at the Globe, told the BBC Fellowes' comments were "misguided". "To see Shakespeare in the original, in its absolutely unchanged form, we need nothing more than a performance space and a company of actors who are able to share his stories in a way that engages their audience," she said. "Shakespeare's for everybody. If we've ever been in love, or fallen out with a friend or been jealous, we can understand him." Ms Banks added one of the reasons Shakespeare's plays were read so widely was because they dealt with fundamental human issues that affect everyone. "Romeo and Juliet is a prime example of that," she said. Much of the work carried out by Shakespeare's Globe involves introducing young people to Shakespeare and his classic plays. Last year, the Globe ran a drama project which introduced the playwright to children as young as three. "When I produce a piece of theatre for young people it is really important they feel Shakespeare is something they have a right to and can access, and could be - if they wanted - something they could return to throughout their lives," Ms Banks said. "It would be very worrying if anyone read [Fellowes' comments] and felt excluded from Shakespeare's original language because of their level of education. She added Fellowes was a "brilliant" screenwriter and said adaptations had an important role to play in the contemporary production of literary texts. "They have the potential to help us re-imagine and re-discover a wealth of wonderful literature. But they are not a prerequisite for their enjoyment by the non-Oxbridge educated members of the population," she said.